"The exchange focuses on doing an act of kindness without expecting anything in return other than that the recipient will, in their turn, pass the kindness along and 'pay it forward' in their own way. We are going to send something fun, inspiring or uplifting to the first *3 blog owners who post a comment on this entry. In turn you will then post about this on your blog, link to us, then send something to the first three people who sign up to play along through your blog. There are no cost restraints, BUT don't go crazy! The little something you send can be something you made, bought, were given or found. No biggie, just a gift that will make the person smile. Maybe something unique from where you live? And, remember that kindness don't have to involve money; there are untold ways to help others every single day, everywhere you go - just look around." *We won't impose on the first 3 to comment since you may have already played it, but on the first 3 who would like to play along. But if you have played it before but would still like to play, that would be really great! Dawson has a nose like a blood hound. Here he is when the package arrived. He kept at it with much encouragement from myself and Foley. 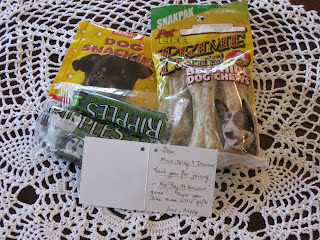 Can you believe we got these wonderful treats from our pal Happy. We are looking forward to being able to continue the exchange. Do you think the crazy old bat will notice that her plastic money card is gone? Hi Moco! You know so many wonderful people and pets, gosh you know everyone! We would love to be part of your Pay It Forward. You have received a really nice package. I am so sorry that my package has not reached you yet. What great gifts Happy sent you guys! We've played pay it forward and it's a lot of fun! What a lovely paw it forward gift. I is playing it with Stella. Hiya Moco, this is a new Blogging game to me, but it sounds good fun. I liked your videos too! But your lovely gifts you received were possibly the best part of all this new game!! just wait til she falls asleep or goes to the bathroom, if she is like our Mom she wont notice for weeks! we like that pay it forward, but our mom won't let us play cuz she doesn't have a job. poor us. you got some great stuff. Happy sure made you happy, didn't he, Moco?! Those treats look good. Thank you for your thoughts and prayers for us during my grandpa's illness and passing. Be careful who you call a crazy old bat, Moco, it just might be the same one who puts the food in your bowl:) Woo sure did get some nice pressies there. How cool is that, Moco?! Hope you enjoy all those tasty treats. It's really fun to get gifts from far, far away. We like to send gifts too, so our mommy is going to let us have another giveaway for all our friends signed up as followers! Good luck! Those treats look very yummy!!! Since you've got Grammie's plastic card why don't you order us some stuff too. Moco, those pay it forwards gifts are dogorrific! what lovely pressies. Looks real delicious too! Am still new at this blogging but I rather like the idea of pawing things forward! Oh that's wonderful! Wait, what's this about plastic money being GONE. It's plastic so it's infinite, RIGHT? Uh, I might need to go cancel an order. Or a dozen. Its obviously very HAPPY to received gift from Happy. 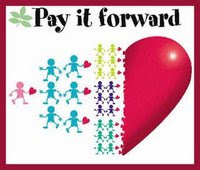 Pay it forward is such a great idea! Hi Moco! It was so nice to hear from you! We worry when you are quiet. It is pouring rain here in Corvallis and cold! Mum went to an Oregon State baseball game but it started raining and then the wind came up and she got cold and came home to warm up. We have the electric fire on and we are all warm and toasty now. Thanks for stopping by our blog! Guess we have to keep her though.. I am glad to hear that Grammie and my ma ape are roughly the same height. Short legs are the best legs! I sure hope Dawson split the goodies evenly among you - they sure do look good. I've never played the Pay it Forward game but it sure looks like a nice thing to do. Paris is gonna get a new haircut like Dawson next week. Her hair is wild and outta control! Those are some awesome pressies! That Happy rules! Moco, we are distressed. For some evil blogger reason you don't show up on the bloggie follower thingy and the servant is sooooooo senile anyway she can't remember OUR blog, much less any others. So we've missed you guys and it's all her fault. What pawsome pressies you received from Happpy! Oh yes both Louie and Callie have great sniffers.